Last October 2018, members of Blue Bay Palau lent their time to the Belau National Hospital- for a good cause. 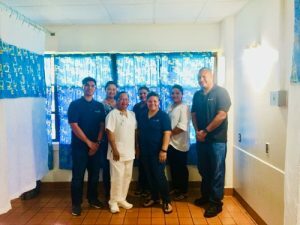 The members spent weekends to adopt two surgical ward rooms for repainting, fixing the lighting conditions, cleaning curtains and bed dividers. Belau National Hospital has been around for 20 years, giving immeasurable service to the community. Every now and then, it needed constant maintenance and seeks support to local and private organizations for helping hands. For the past years, the Blue Bay Team has been extending aid and support to various causes aimed at uplifting communities as part of the company’s corporate social responsibility.